This week on WoW is An Enchantment of Ravens by Margaret Rogerson. By now, my love for pretty covers is well known. 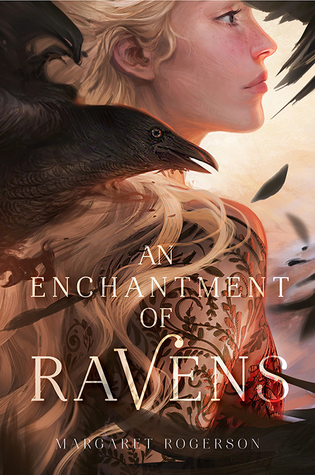 The cover of An Enchantment of Ravens is gorgeous. *. * However, the summary is even better. Magic, faeries, forbidden love is everything I need for a book to be perfect. I know I shouldn't because I may end up disappointed, but I've really high hopes for this one. The book will be released on September 26th. "Isobel is a prodigy portrait artist with a dangerous set of clients: the sinister fair folk, immortal creatures who cannot bake bread, weave cloth, or put a pen to paper without crumbling to dust. They crave human Craft with a terrible thirst, and Isobel’s paintings are highly prized among them. But when she receives her first royal patron—Rook, the autumn prince—she makes a terrible mistake. She paints mortal sorrow in his eyes – a weakness that could cost him his life. Isobel has a choice: she can sacrifice her art for a future, or arm herself with paint and canvas against the ancient power of the fairy courts. Because secretly, her Craft represents a threat the fair folk have never faced in all the millennia of their unchanging lives: for the first time, her portraits have the power to make them feel." Thank you.I think this will be one of fav covers of 2017. I hope you enjoy "An Enchantment of Ravens". It's always a pleasure to let another book lovers know about new releases. I'm sold! This one sounds so very good. And, like you, I love the cover. Thank you for sharing! I want this book as well if for nothing but the cover. I'm horrible right? If you are horrible, so am I. The main reason I first reason why added this "An Enchantment of Ravens" to my wishlist was because of its cover. Thank you. Just a few more days until I have a chance to read it. :) Happy readings! I have been seeing this one around a lot. And you're right, that cover is gorgeous! Great pick! Thanks so much for stopping by my Wednesday post on Lisa Loves Literature earlier! Oh yes, I'm very excited to read this one, too! Gorgeous cover and it's been far too long since I've read a YA fairy story!! Great pick! Oooh, this sounds wonderful -- and sounds like it has some promising worldbuilding too. The world building seems enchanting. Happy readings!